﻿ Gefran India | Gefran Sensor | Gefran pressure Sensor . Render Technology Solutions deal & stock all kinds of Gefran Pressure Sensors in India. Gefran pressure sensors comes in two categories namely Gefran industrial pressure sensors and Gefran melt pressure Sensors, Gefran Industrial Pressure Sensors Gefran range of industrial current, voltage and digital output pressure sensors for measuring pneumatic and hydraulic pressures on factory automation equipment and test systems. Gefran melt pressure transducers & transmitters for plastic extrusion, injection moulding & blow moulding applications. The Gefran KH mobile hydraulics pressure sensor is a low cost compact stainless steel high pressure sensor for use in large quantity OEM applications on mobile vehicles. The KX is available in ranges from 4 bar / 60 psi up to 1000 bar / 15000 psi. The Gefran KHC Series is a compact pressure sensor with a CANopen digital interface for use with vehicle digital networks. The KHC CANopen DS404 coms protocol pressure sensor is available in pressure ranges from 0-1 bar up to 0-1000 bar gauge. The Gefran KX pressure sensor is ATEX approved for use with intrinsic safety barriers in hazardous areas, and is SIL 2 approved for additional safety. The KX is available in ranges from -1 to 1 bar up to 1000 bar. The Gefran KX pressure sensor is ATEX Ex nA non-sparking approved for use in zone 2 hazardous areas with flammable gas or dust atmospheres, and is SIL 2 approved for additional safety. The KX is available in ranges from -1 to 1 bar up to 1000 bar. Contactless magnetic coupling zero tare & span adjustment pressure transmitter with 4-20mA current loop or amplified voltage output signal in pressure ranges from -1 to +1 bar up to 500 bar gauge. Flush diaphragm piezo-resistive pressure sensor for food processing and plastic injection moulding applications with a millivolt output signal in pressure ranges from 10 up to 1000 barg. Flush diaphragm pressure transmitter for high viscosity media in food processing and plastic injection moulding applications. The TPFAS pressure sensor has a small size flush diaphragm which allows the use of a smaller size G1/4 (1/4 BSP) or M10 x 1 male thread for fitting where there is limited room or access to the process measurement point. Very high range pressure sensor with a millivolt output signal for pressure ranges from 1000 up to 5000 bar gauge. 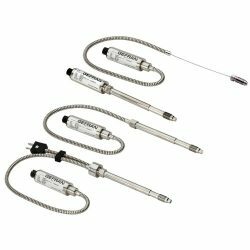 Extra high pressure transmitter with 4-20mA current loop or amplified voltage output signal in pressure ranges from 1000 up to 5000 bar gauge. The operating principle is based on hydraulic transmission of pressure by means of filling fluids with low coefficient of compressibility: mercury (M series), FDA-approved diathermic oil (W series), and sodium-potassium NaK mix (K series), defined as a substance Generally Recognized As Safe (GRAS). Therefore, the entire structure is built to transfer the pressure exerted by the medium on the contact diaphragm to the transduction part, i.e., measurement diaphragm with the strain gauge, keeping it away from the heat source. The strain gauge then transduces the physical pressure quantity into an electrical signal. Innovative IMPACT sensors (I series) are pressure transmitters without transmission fluid: medium pressure is transferred directly to the silicon sensitive element by means of a thick diaphragm. Gefran melt sensors are pressure/temperature transducers and transmitters that measure Melt medium pressure in high temperature environments (up to 538°C).